You can send this card and 1 other Fairy-Type monster from your hand to the Graveyard to negate the activation of an effect of an Effect Monster you opponent controls, and destroy it. You can activate this effect during either player’s turn. Herald of Orange Light used to be a strong tech that you’d see more times than you should have. One of the original Hand Traps, Orange would negate a monster effect and destroy that monster during either players turn. All you needed was Orange and another Fairy monster and I say you saw this more times than you should have because people were playing Herald of Orange in decks that weren’t Fairy. If they had a few Fairy monsters it wasn’t out of place to see Herald in the Side Deck. However, the most you saw him was in the old school Fairy decks and once Archlord Kristya, holy cow! You could set up the Special Summon of Kristya with Orange, then get Orange back and keep using that effect over and over. It was a surprisingly easy monster to abuse in Fairy decks and was one of the better negation effects back when it first was released. Even now in Fairy decks it can be run in 3’s as another way to control your opponents moves. With all the Counter Trap negation they have, standard negation like the Solemn Brigade lineup, 3 more Herald of Orange could drive a player crazy. Still a must for Fairy decks, it has withstood the test of time. Herald of Orange Light is a solid 3/5 card. It’s not broken or too costly. There are cards that support it, and you can run multiple without worrying about dead draws. It’s even a tuner. The major letdowns are the raw stats and the lack of versatility. It only works with Fairy’s to negate monster effects and it doesn’t do much on the field or in the grave. It could be used with Eva to search more heralds. It could help set up the grave for Kristya. Herald of Orange Light certainly shines brightest of the light heralds, but in Counter Fairy’s, Counter Traps are king. I was honestly hoping for Bountiful Artemis to be the Throwback Thursday for this week, but this card is the second best option in my opinion, Herald of Orange Light. Herald of Orange Light is a Level 2 Light Fairy Tuner with 300 ATK and 500 DEF. Level 2s are similar to Level 1s when it comes to having stats, most of them are terrible. Level 2 is searchable since it is a Fairy, you got two options now. A Tuner makes this more versatile than Green or Purple light, and Light is a good attribute. Orange Light here is a hand trap that lets you ditch him/herself and another Fairy to negate a Monster effect and destroy that monster, and this is a Quick Effect like most to all hand traps. 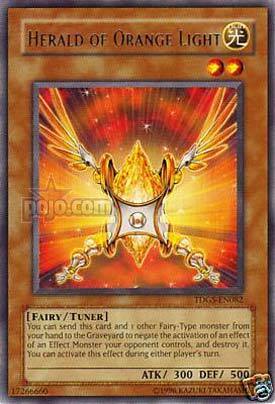 In 2018, we got cards like Solemn Strike and to an extent Recall to negate monster effects, but this is another option if you plan on running more low level Fairies, Orange Light is the best one not only due to being a Tuner, but negating Monster Effects can be better most of the time. Not saying Green or Purple are bad, but Orange is just superior. Play this in Fairy decks, maybe in Counter Fairies as well if you want to mess around with Eva. Also, I should mention this can load up the GY for the new boss monster, which I think this can help trigger the summoning condition for said boss.